You are currently browsing the archives for the Health Professionals category. 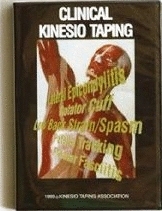 A fan taping is done with a strip of kinesiology tape that is solid at one end and has 3-4 parallel, longitudinal cuts in the other end, creating 4-6 narrow strips. 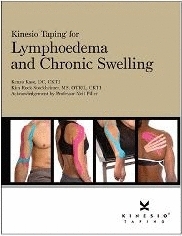 These instructions are for those working with rolls of kinesiology tape, such as SpiderTape or Kinesio Tex Tape. What is a Fan Strip Used For? Fan strips are used in lymphatic tapings to reduce swelling and edema. The goal of lymphatic SpiderTech tape is to create an area of decreased pressure under the tape that allows lymphatic fluid to drain away through nearby lymph ducts. In many situations, more than one fan strip will be used, with the tails overlapping from different directions. Place the muscle to be taped in a position of maximal stretch. Measure the length of tape required to cover the entire muscle. 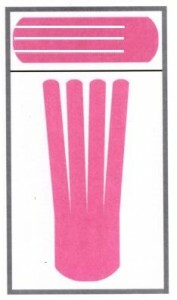 Cut a length of kinesiology tape slightly longer than the muscle, then make the desired number of longitudinal cuts, beginning at one end and finishing approximately 1” from the other end. Round the corners of all cut edges to prevent curling and fraying. 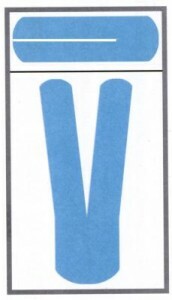 Remove the backing from the base of the tape, and apply it. with no stretch, slightly above the lymph node to which the fluid is to be directed. Rub briskly to activate the adhesive. Move the muscle into a stretched position for application of the tails of the tape. Begin peeling the backing from one of the outer strips, applying it with a very light stretch along the outer edge of the edema or swelling. Apply the next strip parallel to the outer strip. Once the first half of the taping is completed, repeat the process with the other half, laying the tape along the opposite border of the swollen area. 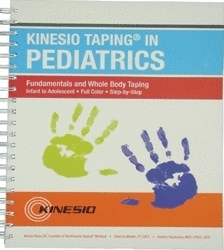 This is the third in a series of posts examining the different cuts that can be used to create effective kinesiology taping applications. 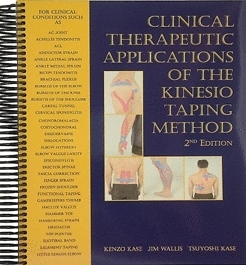 These instructions are for those working with rolls of kinesiology tape, such as Kinesio Tex Tape or SpiderTape. 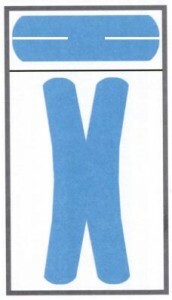 This taping configuration is often used on muscles that cross two joints. 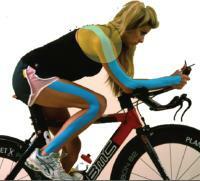 The origin and insertion of these muscles change according to the movement pattern of the joint, i.e., the Rhomboid. Place the muscle to be taped in a position of maximal stretch. Measure the length of tape required to cover the entire muscle. Cut a length of Kinesio Tape slightly longer than the muscle, then cut down the middle of the tape from each end toward the center, leaving the center portion intact. 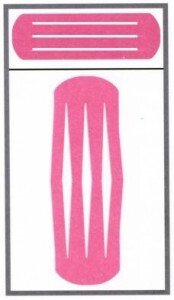 The length of the cut ends in an unstretched state should be approximately the same length as the center portion when stretched. Round the corners of all cut edges to prevent curling and fraying. Tear the backing of the tape across the solid center area and remove the backing to where the tape splits. 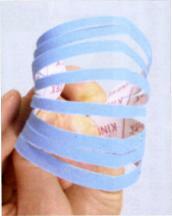 Stretch the center portion of the tape and apply it directly over the muscle belly. Rub the tape to activate the adhesive. One at a time, remove the backing from the tails and apply them, with no stretch, around the outer boundaries of the muscle. Few products have exploded onto the therapeutic scene the way kinesiology tape has in the last year. First developed in Japan over 30 years ago, it leaped from relative obscurity to the international spotlight after the 2008 Beijng Olympic Games. It is now a staple in the practices of progressive athletic trainers, chiropractors, physical therapists and physicians. And the recently-introduced precut kinesiology tape is so simple and effective that thousands of home users are now ordering it online for personal use.